Since my plane back to Europe will leave tomorrow around 12:30pm, this would be my last day in Tokyo in practice. After having breakfast, I went to the near by tourist information center to ask where was the nearest photo-shop where I could develop my instant camera film. After they gave me a host of tourist booklets of Ueno and Asakusa I didn't ask for, they told me the way. The photo-shop staff said the development will take about a half an hour, so I decided to walk around Asakusa and grab the pictures before going somewhere else. That half hour didn't bring up anything interesting to tell, other than that in one clothes department there were some clothes for children that were something you would expect from punk or heavy metal fans. The photographs of kids wearing these clothes were quite bizarre to look at. Kids aren't what they used to be. After having lunch (tonkatsu, my favourite), I picked up the photographs for 1600 yen (compared to the other instant camera I developed later in Finland, these were very well made). I headed for the subway and jumped off at Ueno, which is supposed to have a large park I thought of checking out. Well, it did have one and it must be quite special in Tokyo, but it really wasn't a park where you could fully isolate yourself from the metropolis, thanks to the traffic noise and tall buildings surrounding it. I walked around a large pond and tried to avoid trampling ducks in front of me, which were very lazy in getting out of the way. One thing that I saw again in larger numbers were the homeless. I've seen a lot of them throughout my stay in Japan and it really showed it had become a problem in a country where the economy has been under depression for years and now it was taking its toll. I got bored of Ueno quite soon and went back to the subway station to find a toilet. Wondering where would I find one, a police officer came over and asked what was the problem. He then asked me small things like how long I would be staying in Japan and asked my passport for some reason, but before I could dig out my wallet, he said it was okay and showed me where the toilet was (which was marked with a crummy piece of paper in Japanese). Odd. I decided to check out Harajuku next, since it's said to be a youth orientated area and I was hoping to find some interesting record shops there. What I also knew is that it's a place during weekends where mainly teenagers dress into the most dazzling costumes imaginable, just to hang out and happy to be photographed, but since today was early friday I probably wouldn't see much of this show. 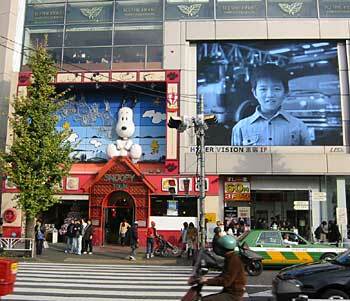 Once I was at Harajuku (via Yamanote-line) I spotted Snoopy town right next to the station, which was a fun place. The store was full of all kinds of Snoopy stuff from towels to headphones, but what really set the unreal feeling in middle of the cuddly Snoopy merchandise was the quiet background music of "the nutcracker". I walked down the main street of Harajuku exploring different stores. At some point I found the kind of record shop I was looking for that sells visual-kei indies releases. Unfortunately there weren't any albums from a certain band I liked (Velvet Eden) and since the latest visual-kei bands didn't fit my taste, I left the shop empty handed (well, with a couple of flyers to be exact, but still). I then decided to visit Shinjuku once more. I wandered there for some time before advancing to Ginza. Feeling a bit hollow I would have to return to Finland tomorrow, I saw something that fit the moment. Near a department store's entrance was a (plastic) Christmas tree. Next to it were people writing down something on small paper cards and hanged them on the tree. 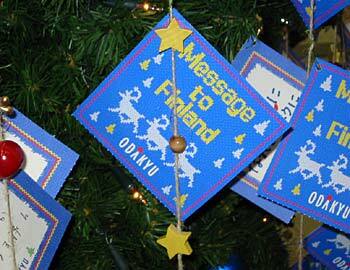 They were greeting cards to Finland! Probably some commercial gimmick, but nonetheless I was touched to see something like that just one day from departure, although those three reindeer remind me of a certain Finnish vodka ... (later I learned that these cards would be sent to Rovaniemi, Finland, probably for display somewhere). When I got back to the hotel in Asakusa, I tried out their special feature: a furo hot bath at the top floor with a view of the Sensoo-ji temple area. Well ... the furo bath was nice, but there wasn't really any clear view to the Sensoo-ji temple from the bath. So if I wanted to see it, I had to get up from the bath and look for it from the window. Otherwise the day had pretty much come to an end. The last thing worth mentioning has seeing Takeshi Kitano chatting with some younger hosts on some tv show . I have no idea what they were talking about. So that was my last full day in Tokyo. It was terribly poorly planned out, but it had its moments. One thing that restricted me from exploring Tokyo to its fullest was the annoying fact that the doors of the hotel would close at 11:00pm, ruling out the possibility of checking out the nightlife of Tokyo. This is actually a quite common rule in most ryokans and hotels I found on the internet, so people planning to visit Tokyo should bear this in mind. At least I will the next time I would visit Tokyo. 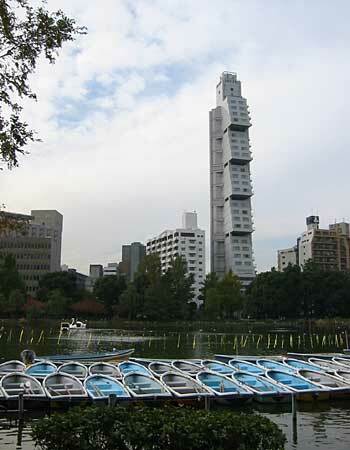 Ueno pond and some interesting architecture. 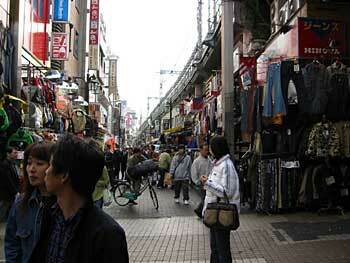 Still at Ueno, a small shopping street next to a railway bridge. At the Harajuku district. Forget the video screen, it's Snoopy town on the left! A flyer of one of those endless visual-kei bands I picked up from an indies record shop (I haven't heard of this band before). Mmm, Finlandia vodka ... I mean *cough* Christmas! Harajuku - A good site that introduces the district in English. Snoopy town - Snoopy also has a website, where you can buy snoopy stuff (only in Japanese though). 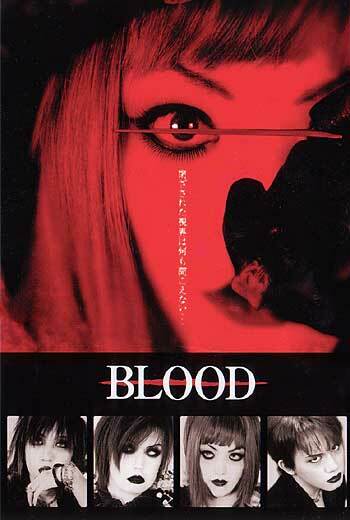 Blood - Website of the band on the flyer.